Today, while the environment is getting more and more attention, the solar street light system is becoming more and more popular. Wista, top LED street light manufacturers, can offer solar lights wholesale services, including LED solar parking lot light wholesale, LED solar street light wholesale, etc. Contact us to know street light price details. 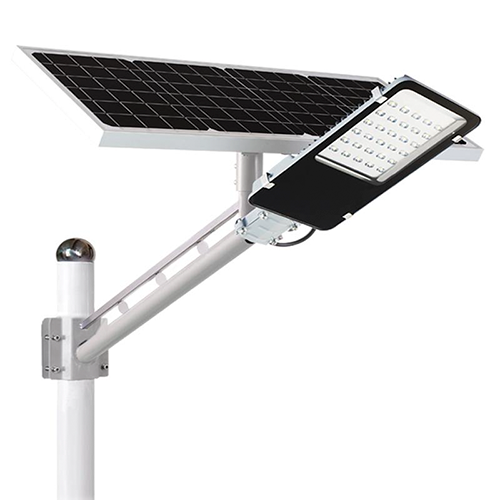 WST-B02A1-12, whose street light fixtures solar panel size is 230*340mm and the arm length is 720mm, has 10W Single crystal and 3.7V/8.8Ah of battery capacity. The solar panel of 24 Watt street light is 280*500mm with 20W Single crystal. And its battery capacity is 7.4V/8.8Ah. 30W solar street lights that have a 7.4V/14Ah battery capacity are 720mm long. The solar panel is 30W and its size is 280*660mm. Available appearance colors: Main color is white. Or to be customized. Provide two types of control lights, including light-control only, light-control and timing. If you want to use the remote control, you will need an extra $10. Catching up with cloudy or rainy weather without the sun, LED solar lights can be maintained for 2-3 days when fully charged. Wide application: street light system, parking lot lighting, gas station lighting, sports fields lighting, airport lighting, and other LED outdoor lighting. As long as there is sunshine, solar LED lights can be used. Welcome to visit our led street light manufacturing factory, we will offer you high quality and competitive price list of solar led street light!